Last week, the undefeated boys golf team took down undefeated Menlo to remain in first place. 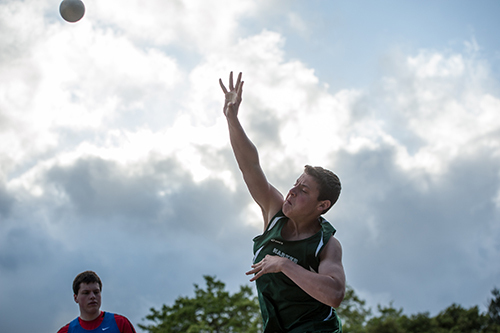 This week, ​they did it again, eking out a 191-194 victory against Sacred Heart Prep. The boys are now in sole possession of first place in the WBAL. Junior Shrish Dwivedi and sophomore Dakota McNealy both shot 2-over-par 37’s to give Harker a three-stoke lead after the first group. Freshman sensation Avi Khemani gave Harker its best score of the day with a 1-over-par 36, crushing his opponent by five strokes and giving Harker a thrilling victory. Harker’s male golfers are off to the best start in their history, after becoming the first Harker team to defeat both Menlo and Sacred Heart Prep in the same season. The boys went 3-0 last week, trouncing Eastside College Prep twice and handing then-undefeated Lynbrook (13-0) their first defeat of the season! The hot week bumped the boys’ record up to 10-2 overall and 4-1 in league. Senior Andrew Zhu led the team in kills over the week, with senior Will Deng, junior Shiki Dixit and freshman Andrew Gu right behind him. Junior Matt Ho led the team in assists. This Friday and Saturday, Harker is a host site for the Bellarmine Tournament, in which some of the top teams in the state will compete. The season is over, but the accolades keep coming! This week, three of Harker’s female athletes were featured in the San Jose Mercury News as honorable mentions for the All-Mercury News girls soccer team: freshman forward Joelle Anderson, junior defender Gabi Gupta and senior goalkeeper Alicia Clark. The Eagles are off to a hot start, posting 15 personal bests in their first league track meet. The top three finishers in the high jump were Harker athletes, led by senior Parth Kothari. Senior Claudia Tischler and freshman Niki Iyer won their 1600m and 3200m, with Iyer’s time of 5:08:84 from last week holding up as the top freshman time in the state. Harker senior Arjun Kumar and sophomore Arthur Ye won their divisions in varsity and junior varsity shotput, respectively. Senior Nithya Vemireddy and junior Julia Wang placed third and fifth in the shotput and second and third in the discus, respectively. The girls beat out King’s Academy last week with a tense 81-78 victory, while the boys fell 77-90. The varsity event winners included senior Manon Audebert, senior Kimberley Ma, sophomore Angela Huang, sophomore Sandhana Kannan, sophomore Grace Guan, junior Aaron Huang, junior Craig Neubieser and freshman Michael Auld. Guan, Angela Huang, Ma, Auld and Aaron Huang all qualified for CCS. Harker’s sluggers earned their first victory of the season in blowout fashion, dominating Andrew Hill 16-4. Junior Sarah Bean, junior Vivian Isenberg, freshman Marti Sutton and sophomore Alisa Wakita each had more than one hit. The boys nearly pulled off a triumphant comeback but finally fell short in an 8-7 loss to Priory. Freshman Varun Haltore had two RBI’s, while junior Keanu Forbes had two hits. On the mound, freshman Nic Bean and senior Varun Kamat combined for 11 strikeouts. The boys lost to state powerhouse Menlo last week, but still own a winning record at 8-5. The junior varsity team has a 4-2 record. The girls suffered some tough league losses last week to rivals Notre Dame San Jose, Gunn and Mitty. Goals were scored by junior Hannah Bollar, junior Allison Kiang, senior Mabel Luo and senior Mary Liu. Senior Christine Lee had 43 saves in goal over those three games.